Most awaited Kindle 2 e-ink readeris finally launched in India. Device is approximately 279 $ in US will be around 300 $ in India (Approximately Rs. 14,000). Kindle is all about new experience of book reading. 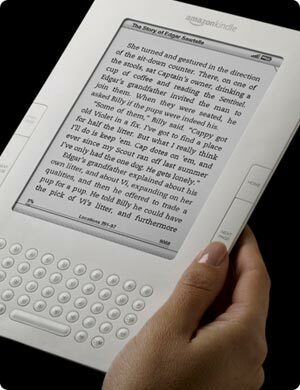 It has LCD with user friendly buttons which enhance book reading experience. With Kindle the whole process of Book publishing is removed. Author write the book, gives it to Amazon to sell. Amazon package in kindle format and distribute through wireless or GSM network at price. Kindle speeds up the process of book distribution and cuts the cost of book manufacturing and distribution. If model works out we wont have printing press, warehouse or courier companies. Kindle has strong architecture behind and allows to use for 10 days with single charge. There is a great point here that Amazon do not have any book distribution in India. They don’t have any warehouse no office of operation. Kindle is a perfect device which lets Amazon enter in any country since the cost of operation of such model is very less. With Kindle Amazon can sell books without even owning any warehouse, or any huge office operations in India. Will they have book pricing model as per Indian region. Books are way too costly in US and local publisher in India provide the same book sometimes at 80% less cost. Network is going to be challenge. Not all the regions in India have great bandwidth for data transfer. Users will have to transfer books being in high bandwidth zone before heading towards rural places. Amazon do not have any Indian portal where users can see the Book prices or Newspaper subscription in Rupee which is local currency. Conclusion: Though it is exciting to see Kindle 2 arriving in India. Kindle 2 is less as a device and more about surrounding services which are still not in its maturity and paying equivalent cost to what is offered in US is not really worth. Once Amazon is able to build surrounding infrastructure for India then it will be worth buying Kindle 2 here.